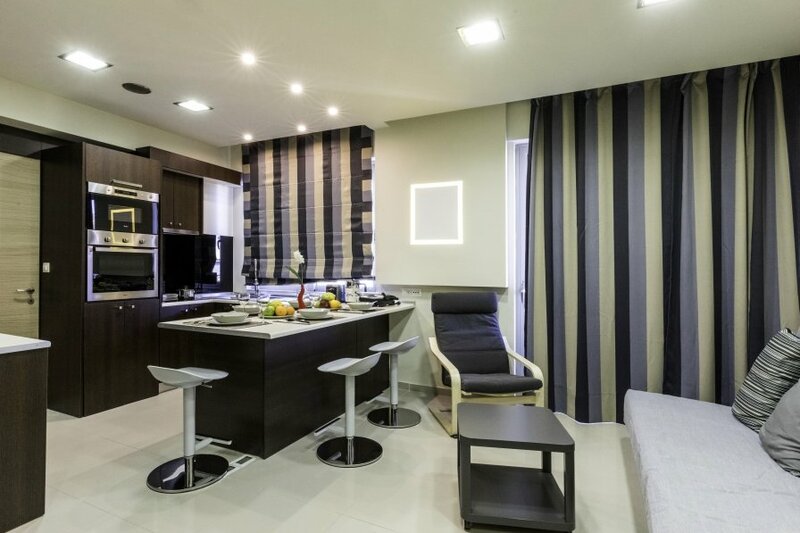 A beautiful luxurius Suite in the heart of Rhodes Town, for business or pleasure. In the heart heart of Rhodes Town, Rhodes Central Suite is an amazing gateway for those who seek holidays few seconds from the Rhodes Town center and less than 5 minutes’ walk of the Old Town. The apartment offers self-catering accommodation and it is innovated with a unique character that will satisfy everyone’s expectations. Rhodes Central Suite is located on the 2nd floor with a nice veranda. There is a bedroom with a double bed and a second bedroom and three single beds, wardrobe, free Wi-Fi a plasma satellite and air-condition. A door leads to a bathroom with a shower and equipped with a hairdryer. There is a fully equipped kitchen with a stove, fridge ,coffee and tea facilities and all the necessary kitchen utilities. The outside veranda is ideal for relaxing moments and amazing coffee time overlooking the Town's scenery. The nearest airport is Rhodes International Airport, 13 km from the property while the nearest beach Elli is a 5-minute short walk. The surrounding area provides to the potential guest an amasing nightlife , supermarkets, playgrounds, grocery stores, coffee shop and many others.